Stay home on Election Day, if you prefer. This year, Salt Lake City is using a hybrid system of voting for the mayoral and district primaries, as well as general elections. The new structure combines a pure vote-by-mail system that mails ballots to all registered voters while operating at fewer physical polling locations than a traditional election. Following a trend set by other municipalities in Utah—and throughout the country—emphasizing vote-by-mail, Salt Lake City will operate only four polling locations for those who still choose to vote in person. Salt Lake County is conducting the election for the city and opted not to operate traditional polls in Salt Lake City a traditional system anyway, because of the decrepit state of the county's voting machines. 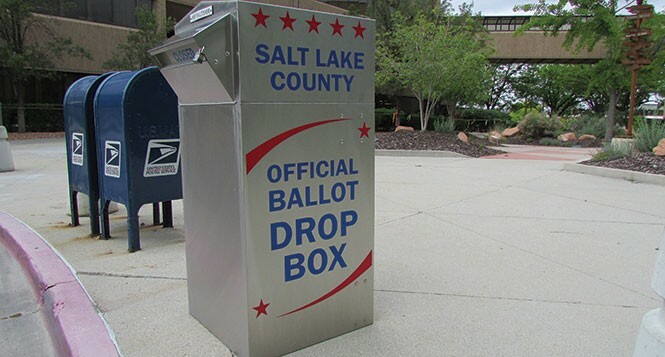 The Salt Lake County Clerk's office will also oversee the elections for all other cities in the county, with the exception of Taylorsville and West Valley City (which declined vote-by-mail and will instead use a consolidated system, with fewer polling locations). The county elections staff notified the Salt Lake City Council in February that the county's touch-screen machines are no longer functional, which is why the county offered to implement the vote-by-mail system. At the time, just under 25 percent of active voters in Salt Lake City were already registered to vote by mail. The change is also a cost-saving measure. According to a report assembled by the city council staff, switching from the traditional to the hybrid system will save the city up to an estimated $37,500 (not including recounts or audits). It's also far less expensive than the county buying new voting machines. In 2014, Salt Lake County Clerk Sherrie Swensen said there was an increase in participation in Cottonwood Heights and West Jordan, the two cities that did away with most traditional polling locations, using vote-by-mail almost exclusively. In 2013, voter participation in Cottonwood Heights was three times higher; in West Jordan, it was 2 1/2 times higher. Any city in Utah could use the boost in participation—the state was ranked third-lowest in participation in 2014, at 28.8 percent of all eligible Utahns voting (behind the national percentage, which was 36.4 percent). Even with fewer polling locations in 2015, there is more flexibility as to where voters can leave their ballots on Election Day. If they choose not to mail in their ballot or don't get it postmarked in time (because although the date of the primary is Aug. 11, ballots must be postmarked by Aug. 10), they can go to a voting center anywhere in the county—as long as the center is in a city that opted in for the vote-by-mail program and is having municipal elections at the same time. That means that someone who lives in Salt Lake City and works in South Jordan, for example, can cast their ballot at a center in South Jordan rather than being limited to voting near their own home. For voters concerned about potential fraud or security issues in the U.S. Postal Service, mail-in ballots can instead be placed in designated drop boxes before 8 p.m. on Election Day. There is one currently in the Salt Lake County Building, but Swensen's office is trying to place seven more throughout the county (locations of which will be online at SLCo.org/Clerk/ once they have been chosen). To help keep the system secure, the vote-by-mail envelope has an affidavit voters must sign on the outer flap. Once the county receives it, they compare the signature with the one they have on file, based on guidelines (such as, loops and spaces between letters) to authenticate the voter. The vote stays confidential, Swensen says. Staff members only open the outer flap to check the signature, and the ballot is still covered. "People don't realize the work we go to, to make sure someone else in the home doesn't vote your ballot," says Swensen. They have been using the same verification system for all mailed ballots. Each individual affidavit is checked, and if it doesn't pass the initial analysis, it goes to a supervisor. Voters whose ballots don't pass muster are notified by mail that there is a problem. This year, mail-in voters can also track their votes online. As voters send in their ballots, a list is updated by the county clerk's office. That list is also accessible by campaign teams. To target their canvassing efforts, all candidates have access to a list of registered voters, which includes names, addresses, party affiliation and parties voted for in the past three primary and general elections. They can use the clerk's offices' updated list to refine their own lists. Each candidate knows who has received a ballot and who hasn't sent one in yet—which means that those who have voted are excluded from the list of doors they knock on, whereas those who haven't voted become a targeted segment. The campaign teams of mayoral candidates Jackie Biskupski and Ralph Becker are telling voters that the system will be different this year, so voters know what to expect. Biskupski thinks the new system is a good idea. "I like that they are sending ballots out to people who aren't registered to vote-by-mail," Biskupski says. However, "I'm a little concerned about the structure—making sure your ballot is postmarked by the 10th versus Election Day will be confusing to the voters." She is also concerned about potential long lines since there are only four polling locations. Because of the four physical voting locations, people who did not receive a mailed ballot can still register to vote on Election Day. In 2014, the county participated in a pilot program passed by the Legislature, allowing voters to register at polling locations on Election Day. "Even someone who didn't get registered or [who] recently moved could still go to a vote center on Election Day," says Swensen. Voters will receive a card in the mail sometime in the next few months, telling them to expect a ballot in the mail 28 days before the election, and detailing where the polling locations will be.